Take the Frackville exit (#124B). Travel north on Rt 61. Church is located approximately 1 block from the first traffic light. on the right hand side of the road. “This is the day that the Lord hath made; let us rejoice and be glad in it!” The joy felt by all of us, as we rejoice in nearly 100 years of Orthodoxy in Frackville, cannot be expressed. Our hearts are overflowing and we radiate pride and humility as we thank God for all that we have in Frackville. Fr. Basil served Holy Ascension from 1924 until 1968 and during his 44 years at Holy Ascension, he and the parishioners witness the growth of the parish as well as improvements of the church. Fr. Basil, with the help of God, strived to make Holy Ascension Orthodox church one of the finest in the region. Parish life would progress rapidly under Fr. Basil’s guidance. Several renovations occurred in the early 1960’s as the church interior was refurnished, the pews repainted, the main body of the church and altar were carpeted and extensive gold leave stenciling was added to the walls which reflected the overall life of the parish. In 2002 the Very Reverend Paul Ropitsky, after many years of faithful service retired and the Reverend Barnabas Fravel was assigned. 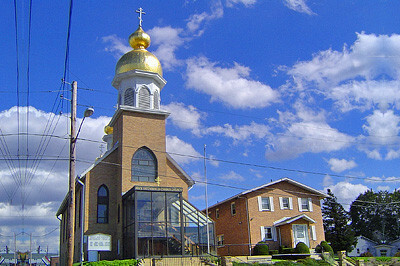 The Holy Ascension Orthodox Church, here in Frackville, remains dedicated to and affiliated with the Orthodox Church in AmericaÃÂ³the Diocese of Philadelphia and Eastern Pennsylvania. Throughout the years, the Holy Ascension Orthodox Church has provided strong support for St. TikhonÃÂ­s Seminary. The seminary is located within this diocese, and a special bond is evident since seven sons have been educated at St. TikhonÃÂ­s and have been ordained as priests: Gregory Dudash, John Kuchta, Joseph Martin, Dimitri Rachko, Michael Rachko, John Stefero and James Weremedic.